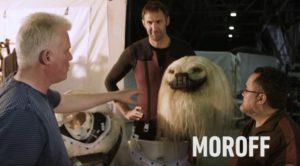 In the past couple of months, a special recurring segment on “The Star Wars Show” was dedicated to going behind the scenes of Rogue One. Entitled “Rogue Reports with Pablo Hidalgo”, there were six such segments, having been included on a [mostly] weekly basis in “The Star Wars Show”, from the end of January through the beginning of March. 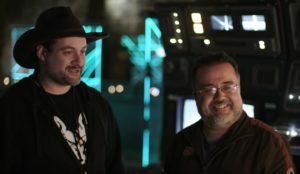 Each segment, MC’ed by Pablo Hidalgo, was usually two minutes or less, out of the 9-minute shows, totalling under twelve minutes for the entirety. The segments were shot a year and a half ago, according to Hidalgo, back in August 2015, amidst the filming of Rogue One. “Rogue Reports with Pablo Hidalgo” is not a segment in which Hidalgo dispenses his Star Wars wisdom, as he typically does on “Rebels Reports”, but rather talking to people and hearing what they have to share. The next two weeks were on “Aliens” (2:11-4:05) – in which we see a little bit about Moroff, Pao, Admiral Raddus, and Bistan – and “Supporting Cast” (3:49-5:52), wherein Hidalgo speaks with a few members of the cast with stories of interest. In March, the shortest of the segments, “Rebel Sets” (7:18-8:19) was published on March 1st, followed a week later by the sixth and final installment of the series, “Droids” (2:33-4:46) on March 8th, looking behind the scenes at the 2-1B surgical droid, astromech droids, and power droids. One can easily go through and watch all of them, which is great. I wonder if there is more footage that didn’t make it into these “Rogue Reports with Pablo Hidalgo” and I don’t mean outtakes. I would love to see discussions of Hidalgo’s on-set, especially pointing out a variety of details and dropping some of his Star Wars wisdom. As it stands, though, these are some neat behind-the-scenes segments. Previous Why Does Lyra Erso Shoot Orson Krennic?